The present invention relates generally to inactivated swine flu virus compositions, methods of preparing such compositions, and to such compositions useful as or in vaccines. Further the present invention relates to methods of preparation, storage and transportation of precursors to and vaccine compositions wherein the precursors and vaccines can be stored and transported at ambient temperatures. It is know that the preparation of vaccines commonly involves the steps of inactivating a live virus (whether it be attenuated, modified or killed), so that the virus thereafter can be introduced into a living being for inducing an active immune response (e.g., a protective response) in the being. The manufacture of such vaccines often encounters any of a number of practical constraints, which create a strain on health care systems. By way of example, in recent history, shortages of influenza vaccines have been experienced due to contamination problems in the manufacturing process. In the context of viral vaccines, one approach to the manufacture of such vaccines has been to grow the specific virus in advance of preparing the vaccine composition, such as by growing the virus in chicken eggs. The manufacture of viruses according to that approach can be expensive, and time consuming, especially considering that many times, one or two eggs may be necessary to yield each dose of vaccine. One classic approach to the manufacture of vaccines has been to inactivate a virus with formalin, binary ethylenimine, formaldehyde or combinations thereof. It is also typically necessary in the manufacture of vaccines to employ one or more preservatives to help prevent contamination by bacteria, fungus or both. Among the most widely employed preservatives have been phenol, 2-phenoxyethanol, or thimerosal, (which contains mercury). Concerns have been expressed as to the potential efficacy, toxicity or mutagenicity of one or more of the above agents or other ingredients of vaccines. There has been a recognized resurgence in vaccine research in recent years, which has placed an even more acute demand upon vaccine manufacturers to address the above issues. Swine Flu Virus is a negative segmented myxovirus. It has infected a significant portion of the human population. Improved vaccines are desired. Due to its widespread affect the there is a need for widespread distribution of precursors to vaccines and vaccines for this virus. One challenge is that many precursors to vaccines and vaccines require storage and transport at low temperatures, sub ambient temperatures. Thus it presents a challenge to provide such vaccines to populations located in places that do not have infrastructure for storage and transport of such precursors at sub ambient temperatures. To prepare vaccines, viruses are inactivated so that they do not infect the host and the antigens are stabilized so that hosts inoculated with the inactivated viruses develop immunological responses. The United States Department of Agriculture has approved protocols for using binary ethylene-imine or formaldehyde to inactivated certain viruses for vaccine production. In U.S. Patent Nos. 5,459.073 ; 5,811099 ; and 5,849,517 , there are disclosed preservative compositions that include a formaldehyde donor agent, and specifically, one or both of diazolidinyl urea or imidazolidinyl urea. That such compositions can be used in a vaccine is addressed in U.S. Patent Nos. 5,811,099 ; and 5,849,517 . Commonly owned and copending United States Application Serial Number 12/940,112 filed November 5, 2010 titled "INACTIVATED VIRUS COMPOSITIONS AND METHODS OF PREPARING SUCH COMPOSITIONS", now published as US 2011/0110975 , discloses contacting a virus with a formaldehyde donor agent having a molecular weight that is greater than about 50 g/mol and less than about 400 g/mol for a period of time (e.g., at least about 12 hours) sufficient for de-activating the infectious, component with the formaldehyde donor agent and for-preserving at least a portion of the surface antigens to form a deactivated virus and the resulting composition. Notwithstanding the foregoing, there remains a need in the art for safer and less toxic inactivated live virus compositions useful in vaccines, more specifically, veterinary vaccines, and still more specifically, inactivated-viral swine vaccines, which can be produced in high yield, with inconsequential toxicity or other potential undesired side effects. What is further needed are vaccine precursors and vaccines that can be stored and transported at ambient temperatures and processes for their production, transport and storage at ambient temperatures. What is needed are compositions that can be manufactured in an efficient manner; that contain components which enhance the disinfectant and antimicrobial properties of the vaccine precursors, that exhibit hemagglutination equal to or better than industry standards, compositions that do not exhibit a loss in titer and are relatively non-toxic. The present invention is directed at a composition comprising a live swine flu virus, having an infectious component and a plurality of surface antigens on the virus in contact with a formaldehyde donor agent having a molecular weight that is less than about 400 g/mol. The formaldehyde donor agent is selected from a non-crosslinking chemical fixative that contains urea. The present invention provides a method for deactivating a live swine flu virus having an infectious component and a plurality of surface antigens, comprising the steps of: a) providing a live swine flu virus having an infectious component and a plurality of surface antigens; and b) contacting the virus swine flu with a formaldehyde donor agent having a molecular weight that is greater than about 50 g/mol and less than about 400 g/mol for a period of time (e.g., at least about 12 hours) sufficient for deactivating the infectious component with the formaldehyde donor agent and for preserving at least a portion of the surface antigens to form a deactivated swine flu virus. In another embodiment, the invention is a method of preparing a composition useful as a vaccine comprising the abovementioned steps in combination with the step of c) mixing a non-toxic effective amount, for inducing an immune response in a subject to which the vaccine is administered, of the deactivated swine flu virus with a pharmaceutically acceptable carrier. Preferably the composition containing a pharmaceutically acceptable carrier is useful in, or as, a vaccine composition. The present invention provides a method for deactivating a live virus having an infectious component and a plurality of surface antigens, comprising the steps of: a) providing a live virus having an infectious component and a plurality of surface antigens; and b) contacting the virus with a formaldehyde donor agent having à molecular weight that is greater than about 50 g/mol and less than about 400 g/mol for a period of time (e.g., at least about 12 hours) sufficient for de-activating the infectious component with the formaldehyde donor agent and for preserving at least a portion of the surface antigens to form a deactivated virus; and c) storing and/or transporting the contacted composition at ambient temperatures, that is without cold storage:or transport. In another embodiment, the invention is a method of preparing a composition useful as a vaccine comprising the abovementioned steps in combination with the step of d) mixing a non-toxic effective amount, for inducing an immune response in a subject to which the vaccine is administered, of the deactivated virus with a pharmaceutically acceptable carrier. Preferably the composition containing a pharmaceutically acceptable carrier is useful in, or as, a vaccine composition. The invention herein also contemplates vaccine compositions prepared according to the methods or using the virus of the foregoing aspects of the invention. The aspects of the present invention offer a number of advantages as compared with existing compositions useful in or as vaccines including the possibility to obtain total protection of mortality without use of an adjuvant; the ability to withstand without damaging the vaccine and/or without aggregating vaccine components after one or more freeze-thaw cycles; a reduction of cross-linking, surface antigens to a significant enough degree that would result in an auto-immune hypersensitivity reaction mediated by mast cells is avoided; the vaccine protects birds from a live virus challenge (e.g., birds are given two vaccinations two weeks apart, and hemagglutination inhibition (HAI) data from samples drawn after the first vaccination indicate that a single vaccination is sufficient); a substantial reduction in the amount of antigen (e.g., a reduction by at least two logs in antigen, and more preferably at least three logs in antigen) necessary to manufacture the vaccine may be realized, a very important economic consideration. The compositions of the invention of prepared, by the method of the invention facilitate 'storage and transportation of vaccine precursors and vaccines at ambient temperatures, that is without the need for storage and/or transportation with refrigeration. The compositions of the invention can be manufactured in an efficient manner, contain components which enhance the disinfectant and antimicrobial properties of the vaccine precursors, exhibit hemagglutination equal to or better than industry standards, do not exhibit a loss in titer and are relatively non-toxic. The invention is useful with flu antigens produced in singular or plural forms in any biological system. Such antigens may be produced in recombinant systems. In particular such antigens may be subjected to the stabilizing and efficacy treatments of the invention. Figures 1. to 28 show graphs of Bio-Activity of IDU stabilized compositions over time as described in the Examples. The explanations and illustrations presented herein are intended to acquaint others skilled in the art with the invention, its principles, and its practical application. Those skilled in the art may adapt and apply the invention in its numerous forms, as may be best suited to the requirements of a particular use. Accordingly, the specific embodiments of the present invention as set forth are not intended as being exhaustive or limiting of the invention. The scope of the invention should, therefore, be determined not with reference to the above description, but should instead be determined with reference to the appended claims, along with the full scope of equivalents to which such claims are entitled. The present invention is directed at a composition comprising a deactivated swine flu virus having an infectious component and a plurality of surface antigens in contact with a formaldehyde donor agent having a molecular weight that is less than about 400 g/mol. In addition the present invention provides an improved method for deactivating a live swine flu virus having an infectious component and a plurality of surface antigens, comprising the steps of: a) providing a live swine flu virus having an infectious component and a plurality of surface antigens; b) contacting the swine flu virus with a formaldehyde donor agent having a molecular weight that is greater than about 50 g/mol and less than about 400 g/mol for a period of time sufficient for de-activating the infectious component with the formaldehyde donor agent, and for preserving at least a portion of the surface antigens to form a deactivated swine flu virus. In another embodiment the invention is a method of preparing a composition comprising the abovementioned steps in combination with the step of c) storing or transporting the mixture at ambient temperatures. In another embodiment the invention is a method of preparing a composition comprising the abovementioned steps in combination with the step of d) mixing a non-toxic effective amount, for inducing an immune response in a subject to which the vaccine is administered, of the deactivated swine flu virus with a pharmaceutically acceptable carrier. Preferably the composition containing a pharmaceutically acceptable carrier is useful in, or as, a vaccine composition. In another embodiment, the invention is a method comprising the steps of:a) providing a live swine flu virus having an infectious component and a plurality of surface antigens; b) contacting the swine flu virus with a formaldehyde donor agent having a molecular weight that is greater than about 50 g/mol and less than about 400 g/mol for a period of time sufficient for de-activating the infectious component with the formaldehyde donor agent, and for preserving at least a portion of the surface antigens to form a deactivated virus c) transporting or storing the contacted composition at ambient temperature. further comprising a step of contacting the virus with an adjuvant; the mixing step (c) occurs immediately following the contacting step (b); the contacted composition is transported or stored at ambient temperature; the contacted composition is transported at ambient temperature; and ambient temperature is from about 20 °C to about 37 °C. The compositions may further comprise any one or more of the features described in this specification in any combination, including the preferences and examples listed in this specification, and includes the following features: the virus manufactured by growing.the virus in tissue or a chicken egg; the formaldehyde donor agent is selected from a non-crosslinking chemical fixative that contains urea; the formaldehyde donor agent is selected from diazolidinyl urea (DU), imidazolidinyl urea (IDU), or a mixture thereof; the formaldehyde donor agent is present in a concentration of less than about i w/v (grams per 100 ml total volume) or less; further comprising a pharmaceutically acceptable carrier or diluent; and the composition can be transported and stored at ambient temperatures. The live virus useful in this invention is a swine flu virus. The amount of time for the contacting step preferably is sufficient for deactivating the virus (whether by attenuating it, modifying it or killing it), while sufficiency preserving surface antigens so that when a subject is vaccinated with a vaccine composition including the deactivated virus, the deactivated virus will induce an immunity response (e.g., a response that is measurable by Hemagglutination Inhibition Assay, such that the response allows the vaccinated subjects to survive exposure to a lethal dosage of the live virus). In a preferred embodiment, the contacting occurs for a period of time of about 12 hours or greater and more preferably about 24 hours or greater. In a preferred embodiment, the contracting occurs for a period of time of about 240 hours or less, more preferably 120 hours or less, even more preferably about 72 hours or less, and most preferably about 48 hours or less. In a preferred embodiment, the contacting step occurs at a temperature of about 20 °C or greater, more preferably about 23 °C or greater and most preferably about 25 °C or greater. In a preferred embodiment, the contacting step occurs at a temperature of about 37 °C or less, more preferably about 30 °C or less; and most preferably about 25 C or less. The viral infection that is useful in the teachings herein is a swine flu virus. More specifically, the virus is a strain of Swine Flu Virus is selected from those designated H1N1, H1N2, H3N2 or the like. When the virus is used in a composition used as a vaccine it is provided in a sufficient amount for invoking an immunity response in a subject to which the vaccines herein are administered. By way of example, the swine fluid virus may be provided in a live titer amount of about 103 to about 1012 titer per milliliter of the resulting vaccine composition and more preferably about 106 to about 1011 titer per milliliter of the resulting vaccine composition. More specifically, the virus titer may range from about 106 to about 108 titer per milliliter of the resulting vaccine composition. The formaldehyde donor agent is selected from a non-crosslinking chemical fixative that contains urea. The formaldehyde donor agent is selected from diazolidinyl urea (DU), imidazolidinyl urea (IDU), or a mixture thereof. The formaldehyde donor agent may consist essentially of diazolidinyl urea (DU) imidazolidinyl urea (IDU), or a mixture thereof. In the embodiment wherein the virus is a swine flu virus, the contacting step generally includes contacting the virus with the formaldehyde donor agent having a concentration of about 1 w/v (grams per 100 ml total volume) or less and more preferably about 0.5 w/v or less. Preferably, the formaldehyde donor agent may be present in a concentration of about 0.0625 w/v (grams per 100 ml total volume) or greater and more preferably about 0.1 w/v (grams per 100 ml total volume) or greater. The contacting step may be the only step during which the live virus is contacted with the formaldehyde donor agent. The mixing step is a step that can be employed for preparing the resulting composition useful as a vaccine. The.mixing step may occur immediately following the contacting step (such that there is no intermediate washing, quenching step or other step by which the deactivated virus would be subjected to a fluid other than a carrier of the vaccine composition), or it may occur during the time period when the contacting step (b) is occurring. Thus, it will be appreciated that during the mixing step the deactivated virus will remain in contact with solution that includes the formaldehyde donor agent. During the mixing step, the antigen-treated virus may be maintained at a temperature above about 15 °C (e.g., it may be about room temperature). As taught in U.S. Patent No. 7,252,984 , a carrier or diluent may include one or any combination of stabilizers, preservatives and buffers. Suitable stabilizers may include, for example SPGA, carbohydrates (such as sorbitol, mannitol, starch, sucrose, peptone, arginine, dextran, glutamate or glucose), proteins (such as dried milk serum, albumin or casein) or degradation products thereof. Suitable buffers may include for example alkali metal phosphates. Suitable preservatives may include thimerosal, merthuilate and gentamicin. Diluents include water, aqueous buffer (such as buffered saline) and polyols (such as glycerol). It will be appreciated that vaccine compositions herein, as well as any of its carrier or diluents is preferably free of any anti-biotic, and/or any mercury-containing ingredient. The method may further comprise a step of contacting the virus with an adjuvant. Any suitable adjuvant may be utilized in the compositions and methods of this invention. Exemplary adjuvants include those selected from one or any combination of lecithin, a pharmaceutically acceptable polymer, saponin or a derivative thereof, cholesterol, aluminium hydroxide, -phosphate or -oxide, oil-in-water or water-in-oil emulsion based on, for example a mineral oil, a vegetable oil (such as vitamin E acetate), or some other suitable carboxylic acid. See, e.g., U.S. Patent No. 5,152,981 . The composition and method for making it is a relatively simple and elegant to a technology that previously has seen various potentially complicating approaches. Though such approaches may be employed with the teachings herein, it is preferable that the vaccine composition and the virus are free of any contact with any plant-cell-produced components: the virus includes or is free of an infectious genetically engineered, genetically modified or cloned virus; the method is free of any step of contacting the virus with binary ethylene-imine, formaldehyde, formalin, phenol, 2-phenoxyethanol, thimerosal, bromo-ethylene-imine, ethyl methane sulfonate, nitrosoguanidine, fluorouracil, 5-azacytadine, or any combination thereof; or any combination of the foregoing. It is also possible that the vaccine composition may include or be free of any neutralizing antibodies bound to the surface antigens. It is also possible that the vaccine composition may otherwise include or be free of an antioxidant. Other variations of the invention are also possible. To illustrate, the method may include a step of freeze-drying and re-hydrating the antigen-treated virus. The antigen-treated virus may include or be free of any temperature reduction to a temperature below about 10'C (e.g., to below about 0°C). The method may include or be free of any step that removes the formaldehyde donor agent prior to the mixing step. Accordingly, the various aspects of the invention contemplate that the administration of the vaccine composition is accomplished in the absence of any step of diluting the composition at the time of or at the site of administration of the vaccination. The mixing step described previously could constitute the only diluting step that occurs in the methods herein. The method may also include one or more steps of storing the resulting composition for a period of at least 30 days, at least 60 days, or even at least 90 days following the mixing step; storing the resulting composition at one or more temperatures of below about 1 St (e.g., about 0 to about 10 °C), with the composition retaining its stability under such conditions (e.g., the amount of useful deactivated virus remains within about 20% and more preferably within about 10% of the titer amount at the time of the mixing step). The composition may be stored in suitable sealed containers, such as stopped vials (e.g., rubber stopped glass or plastic vials), sealed syringes, blister packaging, or otherwise. Preferably the method includes storing or transporting any composition of the invention or prepared by the methods of the invention at ambient temperature, wherein ambient temperature is defined hereinbefore. When such compositions are stored or transported at ambient temperatures such compositions retain their efficacy as described hereinbefore. The method may also include one or more steps of performing an assay of the deactivated virus to confirm that the infectious component has been de-activated. The methods herein further contemplate immunizing a subject with a vaccine composition prepared according to the present teachings. Thus the methods herein may further comprise at least one step of administering a subject in need of immunization with the vaccine composition described in the present teachings. Any step of administering a subject in need of immunization with the vaccine composition by performed by ingestion (e.g., from drinking water), intranasally (e.g., by aerosol), intraocularly (e.g., by aerosol), via intramuscular injection, by subcutaneous injection, by delivering into eggs prior to hatching (e.g., manually or by machine); or any combination thereof. A plurality of steps of administering the vaccine to the subject may be performed at intervals (e.g., they may be administered to the same subject on multiple occasions, such as at intervals of at least 3 days). By way of further example, at least two steps of administering the subject may performed at intervals of greater than one week (e.g., about 14 days apart). It is also possible that only a single dose is administered and is sufficient for achieving the desired satisfactory immune response. As gathered from the foregoing, another aspect of the present invention is directed at deactivated virus described herein that has been contacted with a formaldehyde donor agent according to the above teachings, as well as compositions useful as vaccines (including the and one or more of the other ingredients, e.g., one or more of a carrier, an adjuvant, or both) resulting from the methods herein. Resulting viruses treated according to the teachings herein may be characterized as being free of cross-linking with other surface antigens of the virus. The dosage of the vaccine preferably will be a sufficient amount for inducing immunity in the vaccinated subjects against challenge by a virulent form of the virus, wherein immunity can be described as the realization within a period of 4, days, more preferably 7 days, and still more preferably 14 days after challenge of a death rate due to the virulent form of the virus that is less than 50% of the population of subjects challenged, more preferably less than 25% of subjects challenged and still more preferably less than 5% of subjects challenged (e.g., approximately 100% of challenged subjects survive the challenge). Challenges include the step of administering the virulent form of the virus to the subject in a 100% lethal dosage amount. Though illustrated in connection with immunization for prevention of swine flu virus, the present invention is not intended to be so limited. It may have application for immunization for prevention of other viruses, including but not limited to other avian paramyxoviruses, avian influenza (e.g., H5 or H7 influenza, such as H5N1 influenza), avian polyoma virus, Pacheco's disease, West Nile Virus, diminuvirus, chicken anemia virus, or Circo virus. The vaccine compositions herein may also include a plurality of antigenic components suitable for immunizing against a plurality of viruses. For example, the invention contemplates that the resulting vaccine may immunize against Swine Flu Virus and one or more other viruses. The methods and compositions herein may be employed in the immunization of mammal and avian subjects. The method of the invention comprises the steps of: providing a live virus having an infectious component and a plurality of surface antigens; b) contacting the virus with a formaldehyde donor agent having a molecular weight that is greater than about 50 g/mol and less than about 400 g/mol for a period of time sufficient for deactivating the infectious component with the formaldehyde donor agent, and for preserving at least a portion of the surface antigens to form a deactivated virus. The method of the invention may further comprise one or more of the following features in any combination. The virus is grown in a chicken egg; the virus is Swine flu virus; the formaldehyde donor agent is selected from, or consists essentially of, a non-crosslinking chemical fixative that contains urea. The formaldehyde donor agent is selected from, or consists essentially of, diazolidinyl urea (DU), imidazolidinyl urea (IDU), or a mixture thereof. The resulting solution consists essentially of de-activated virus and the formaldehyde donor agent; the contacting step includes contacting the virus with the formaldehyde donor agent having a concentration of less than about 1 w/v (grams per 100 ml total volume) or less, preferably about 0.5 w/v or less (grams per 100 ml total volume) and preferably about 0.625 w/v (grams per 100 ml total volume or greater), and more preferably about of about 0.1 w/v (grams per 100 ml total volume) or greater. The contacting step (b) occurs for a period of about 24 to about 72 hours. The contacting step (b) occurs at a temperature of about 20° C to about 37 °C, preferably about 25 °C. The mixing step (c) occurs immediately following the contacting step (b). During the time period throughout the contacting step (b) the antigen-treated virus is maintained at a temperature of about 20 °C or greater. The contacting step (b) is the only step during which the live virus is contacted with the formaldehyde donor agent. The resulting composition may be free of any contact with any plant-cell-produced components. The virus includes an infectious genetically engineered, genetically modified or cloned virus. The virus may be free of any infectious genetically engineered, genetically modified or cloned virus. The method is free of any step of contacting the virus with binary ethylene-imine, formaldehyde, formalin, phenol, 2-phenoxyethanol, thimerosal, bromo-ethylene-imine, ethyl methane sulfonate, Nitrosoguanidine, fluorouracil, 5-azacytadine, or any combination thereof. The method may include a step of freeze-drying and re-hydrating the antigen-treated virus. The method may further comprise a step of performing an assay of the deactivated virus to confirm that the infectious component has been de-activated. The method may be free of any step of reducing the temperature of the virus to below about 20°C. The surface antigens may be free of cross-linking with other surface antigens of the virus. The method may further comprise; c) mixing a non-toxic effective amount for inducing an immune response in a subject to which the vaccine is administered of the deactivated virus with a pharmaceutically acceptable carrier for forming a vaccine composition. The method may further comprise a step of contacting the virus with an adjuvant. The mixing step (c) may occur immediately following the contacting step (b); during the time period throughout the contacting step (b) and the mixing step (c). The antigen-treated virus is maintained at a temperature of about 20 °C. During the time period throughout the contacting step (b) and the mixing step (c), the antigen-treated virus may be free of any temperature reduction to a temperature below about 20 °C. The method may be free of any step that removes the formaldehyde donor agent prior to the mixing step (c). The composition of the invention comprises a deactivated virus having an infectious component and a plurality of surface antigens in contact with a formaldehyde donor agent having a molecular weight that is less than about 400 g/mol. The composition of the invention may further comprise one or more of the following features in any combination. The formaldehyde donor agent is selected from, consists essentially of, a non-crosslinking chemical fixative that contains urea. The formaldehyde donor agent is selected from, consists essentially of, diazolidinyl urea (DU), imidazolidinyl urea (IDU), or a mixture thereof. The formaldehyde donor agent is present in a concentration of about 1 w/v (grams per 100 ml total volume) or less and more preferably about 0.5 w/v (grams per 100 ml total volume) or less and about 0.625 w/v (grams per 100 ml total volume) or greater and more preferably about 0.1 (grams per 100 ml total volume) or greater. The composition further comprises a pharmaceutically acceptable carrier or diluent. The resulting composition may be free of any contact with any plant-cell-produced components. The virus may include an infectious genetically engineered, enetically modified or cloned virus; the virus is free of any infectious genetically engineered, genetically modified or cloned virus. The composition is free of binary ethylene-imine, formaldehyde, formalin, phenol, 2-phenoxyethanol, thimerosal, bromo-ethylene-imine, ethyl methane sulfonate, Nitrosoguanidine, fluorouracil, 5-azacytadine, or any combination thereof. The surface antigens may be free of cross-linking with other surface antigens of the virus. A non-toxic effective amount for inducing an immune response in a subject to which the vaccine of the deactivated virus of a pharmaceutically acceptable carrier is administered. The composition retains its immunological efficacy after storage and transportation at ambient temperature, about 20 °C to about 37 °C and more preferably about 23 °C to about 30 °C. lnactivation Sample Hemagglutination Assay (HA) is run to determine if inactivation treatment degrades virus surface epitopes necessary for hemagglutination. If so, the HA result should be negative. The desired, result is positive hemagglutination, thereby confirming that surface epitopes are preserved. More specifically, in this assay, a sample is incubated with a fresh preparation of chicken red blood cells (cRBC5). Hemagglutination (HA) is defined as the clumping of cRBCs. The virus can promote hemagglutination through the interaction of molecules on the virus surface with molecules on the surface of cRBC5. Damaged or degraded virus does not promote hemagglutination. Depending on the sample used (treated/untreated virus or allantoic fluid-AF-from inoculated eggs), the results may be interpreted differently. If the sample is treated/untreated virus (the inactivation sample), a positive HA result indicates that the virus is not degraded due to the treatment-it gives no information (in this case) about the viability of the virus (inactivation state). If the.sample is the allantoic fluid from an inoculated egg, a positive HA result indicates that the virus is not inactivated by the treatment (the virus was active and able to replicate in the egg). If the virus is completely inactivated by the treatment (eg-incubation with DU/lDU/BEI/formaldehyde), the small amount of virus in the inoculum would be diluted out by the large volume of AF, and the HA result would be negative. Embryonic Toxicity assay is run to determine if the virus is still viable after the inactivation treatment. If still viable the virus would replicate in allantoic fluid and kill an embryo to which it is contacted. The desired result is embryonic viability, thereby confirming the presence of no live virus. More specifically, embryonic toxicity is assessed by candling the eggs, such that an egg is placed on a source of bright light (e.g. a flashlight), and the embryo is directly observed. Viable embryos are identified by certain visual cues (pulsatile vasculature, for example). In these experiments, embryonic death may be due to one of three things: (1) injury/infection resulting from the needle stick used in the injection; (2) chemical toxicity (by inactivating agent-DU/IDU); or (3) live virus replication (as a result of incomplete NDV inactivation). Allantoic fluid (AF; from injected eggs) HA Assay is run to determine if the virus is not viable. If not viable, inactivated virus would not replicate and injected virus would be diluted out in AF. If, after 'inactivation' treatment, the virus is still viable, allantoic fluid would contain high enough titer of virus to promote hemagglutination. The desired result is negative hemagglutination, thereby confirming that the AF fluid contains no live virus. Chicken Embryonic Fibroblast (CEF) Immunofluorescence (IF) Assay is run to determine whether successful inactivation occurs. It is recognized that chicken embryonic fibroblasts (CEF) grow well in culture and are highly susceptible to infection by liveSwine Flu. In this assay, allantoic fluid (AF) from inoculated eggs is applied to confluent CEF monolayers. After 5 days, cells are washed, fixed and stained with anti-viral antibodies. Positive staining indicates that there was live virus in AF, and therefore, 'inactivation' treatment is unsuccessful. The desired result is no staining (which indicates that the virus had been completely inactivated), and supports that the AF fluid contains no live virus. Hemagglutination Inhibition Assay is run with serum samples obtained from vaccinated and/or control animals are incubated with live virus prior to use in the aforementioned HA assay. If the cRBCs do not agglutinate (negative result), the conclusion is that there were specific anti-viral antibodies in the serum (seroconversion) which blocked the viral antigens from interacting with the cRBCs. A serum HA1 titer of greater than 16 correlates with an animal successfully rejecting a subsequent live viral challenge. An example of one such assay is found in Allan and Gough, "A standard haemagglutination inhibition test for Newcastle diseasc. (2) Vaccination and Challenge". Vet Rec., Vol. 95, Issue 7, 147-1 49, August 17, 1974. Testing is performed on Swine influenza virus (SIV) H1N1. The virus is characterized in red blood cells (RBC) a permissive cell type for assaying the hemagglutination (HA) activity and cytopathic effect (CPE) is identified. Imidazolidinyl urea preparations are prepared in Dulbecco's phosphate buffered saline at concentrations as descrbed hereinafter. Equal volumes of virus are mixed with the imidazolidinyl urea. The resulting solutions are then serially diluted and added to cell monolayers. The plates are incubated at 37 °C, in 5 % carbon dioxide for 5 to 6 days. The monolayers are observed for morphological changes associated with cytotoxicity effect (CTE) or CPE caused by imidazolidinyl urea and Swine Influenza Virus. The data demonstrates that imidazolidinyl urea levels of 0.0625, 01250, 0.2500 and 0.5000 levels significantly reduce SIV infectivity with incubations of 37 °C for 18 hours. The inactivation of SIV infectivity using imidazolidinyl urea, BEI and an untreated SIV control is studied. The virus is prepared as described hereinbefore. The virus is expanded to a total of 350 ml and the infectivity and HA bioactivity is determined as approximately 8.00 TCID50/ml and 1280 HA/ml. Infectivity is determined using a MDCK cell line and microscopic observations for cytopathic effects as the 50 percent end point. Complete inactivation is tested using fluorescent antibody to type A influenza. The HA bioassay is performed using chicken red blood cells that are observed and scored for hemaglutination. Three treatment groups are prepared, IDU treated, BEI treated and untreated. Each preparation is incubated at room temperature for approximately 72 hours with continuous rocking. After incubation, infectivity and HA bioactivity are tested using MDCK and chicken red blood cells, respectively. Each preparation is aloquoted into four volumes and placed at 2-7 °C, 22-25 °C, 35-38 °C, and 40-42 °C. Samples are collected at 0 days, 7 days, 14 days, 21 days, 1 month, 3 months, 6 months and 12 months. the HA bioactivity is tested on the day of collection at each time point. A 3 percent BEI solution is prepared and 4.5 ml is mixed with 150 ml of virus lysate. A 10 percent stock of imidazolidinyl urea is prepared in sterile RO/DI water and filter stabilized. A 0.5 percent imidazolidinyl urea concentration a 7.5 ml portion of th e10 percent stock is mixed with 150 ml of virus lysate. Infectious titers of the base samples are determined for the untreated version as 8.00 TCID50/ml and 8.50FAID50/ml. For BEI treated and IDU treated samples, the results are below the level of detection, where the level of detection is ≥ 1.3 TCID50/ml and 1.3 FAID50/ml. BEI 35-38 128 128 64 64 64 64 2 4. H1N1 virus was inactivated using 0.5% IDU or 3% v/v BEI at room temperature for 72 hours. Preparations of each sample were placed at 2-7°C. 22-25°C, 35-39°C and 40-42°C for the forced degradation assay. Samples were collected and tested for HA bio-activity every week for the first month, at three months, three and a half months, six months, twelve months, fifteen months, eighteen months and twenty-one months. After three and a half months the testing of all samples being stored at 40-42°C was discontinued due to loss of detectable HA bio-activity. After twelve months, the testing of all samples stored at 35-39°C was discontinued due to loss of detectable HA bio-activity. Additional HA bio-activity has been tested on the H1N1 isolate stored at 2-7oC and 22-25oC at fifteen months, eighteen months and twenty-one months. All samples collected to date have been tested for HA bio-activity using cRBC. The positive control viruses (H1N1 or H1N2 isolates, not-inactivated) had HA titers of 6-8 (log base 2) during the twenty-one months. The HA bio-activity was retained in all samples tested following inactivation.The HA bio-activity of samples stored at 2-7oC fluctuated between titers of 7 and 8 during the twenty-one months of incubation. The only exception was month six in which all samples had a titer of 6. The results are graphed in Figure 1. The HA bio-activity of the untreated and IDU-inactivated viruses stored at 22-25°C fluctuated between titers of 6-8 through the fifteen months of incubation, then decreased to a titer of 4 after twenty-one months of incubation. The HA bio-activity of the BEI-inactivated virus stored at 22-25°C fluctuated between titers of 7 and 8 through the first three and a half months of incubation, then was undetectable (titer of <2) after twenty-one months of incubation. The results are graphed in Figure 2. In the first phase of testing, there was no real difference in HA bio-activity between any of the H1N1 isolate treatments stored at 2-7°C for up to twenty-one months following inactivation. The H1N1 isolate inactivated with IDU demonstrated at least a retention of 3 to 4-fold greater amount of HA bio-activity compared to the BEI inactivated virus from-fifteen months through twenty-one months of incubation at 22-25°C. The HA bio-activity of all Phase I samples collected during the first fifteen months of incubation were tested using one lot of cRBC. The HA bio-activity titers for all samples were within 2 logs of the original titer obtained on the day of collection. 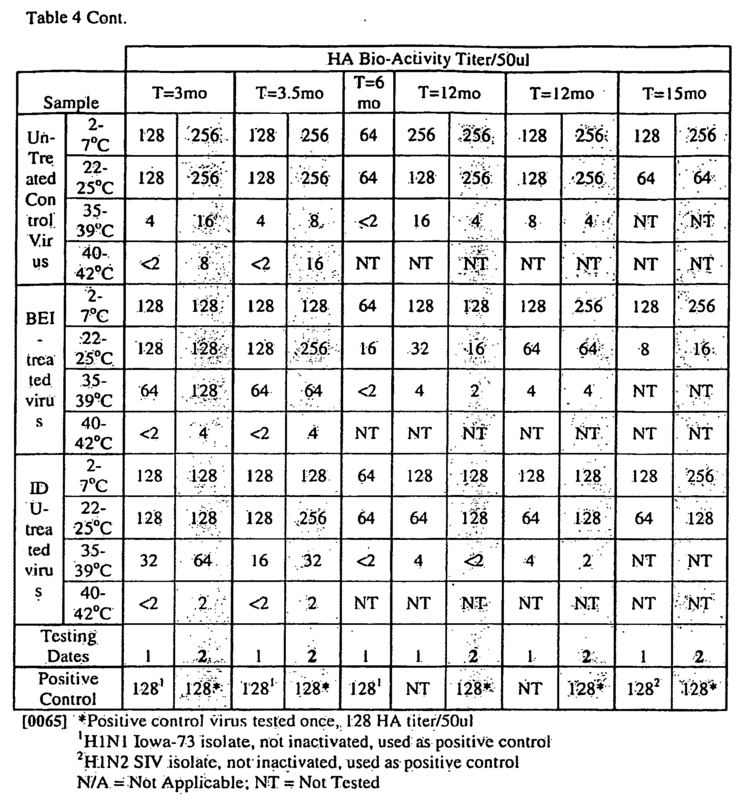 The only exception is the untreated virus stored at 40-42°C at three and three and a half months which had titers that were 3 and 4 logs higher, respectively, than those obtained on the original days of collection (see Table 4). The purpose of Phase II of this project was to extend the HA bio-activity testing of the H1N2 virus and H3N2 virus from three months to one year. The H1N2 and H3N2 viruses were inactivated using IDU and BEI. The H1N2 and H3N2 viruses were inactivated with 0.5% IDU and 3% v/v BEI at room temperature for 72 hours. The untreated virus samples were retained at 2-7°C until the initiation of the forced degradation assay. Preparations of each sample were placed at 2-7°C, 22-25°C, 35-39°C and 40-42°C for the forced degradation assay. Samples were collected and tested for HA bio-activity on days three, seven, ten, fourteen, and twenty-one; one month, two months, three months, four months, six months, nine months and twelve months. After the four month testing date all samples being incubated at 40-42°C were no longer tested due to a loss of detectable HA bio-activity. Treatment of the H1N2 and H3N2 SIV isolates with 0.5% IDU and 3% v/v BEI for 72 hours resulted in complete SIV infection inactivation (≤1.5 TCID50/ml). No cytopathic effect was observed in indicator cells. As expected, there was a minimal cytotoxic effect due to the IDU. The H1N2 SIV virus yielded a titer of 5.8 TCID50/ml before inactivation and the H1N2 positive control virus yielded a titer of 6.8 TCID50/ml. The H3N2 SIV virus yielded a titer of 4.8 TCID50/ml before inactivation and the H3N2 positive control virus yielded a titer of 6.0 TCID50/ml. The HA bio-activity was tested on days three, seven, ten, fourteen, and twenty-one; one month, two months, three months, four months, six months, nine months and twelve months. All samples collected to date were tested for HA bio-activity using cRBC. The H1N2 positive control has had an HA titer of 6-7 and the H3N2 positive control has had an HA titer of 5-7 during the twelve months. The HA bio-activity was retained in all samples tested following inactivation. The HA bio-activity of the untreated and BEI-inactivated H1N2 viruses stored at 2-7°C fluctuated between titers of 6 and 7 through twelve months of incubation. The HA bio-activity of the IDU-inactivated H1N2 viruses stored at 2-7°C fluctuated between titers of 6 and 7 through the first two months of incubation then decreased to a titer 4 after twelve months, see Figure 3. The HA bio-activity of the untreated and BEI-inactivated H1N2 viruses stored at 22-25oC fluctuated between titers of 6 and 7 through twelve months of incubation. The HA bio-activity of the IDU-inactivated H1N2 viruses stored at 22-25oC retained a titer of 6 through the first twenty-one days of incubation, then decreased to a titer of 2 after twelve months see Figure 4. The HA bio-activity of the untreated and BEI-inactivated H1N2 viruses stored at 35-39°C fluctuated between titers of 6 and 7 through the first month of incubation, then was undetected (titer of <2) after three months. The HA bio-activity of the IDU-inactivated H1N2 viruses stored at 35-39°C retained a titer of 6 for the first three days, retained a titer of 4 through fourteen days and then gradually decreased below the level of detection to a titer of <2 after three months. The titer for the untreated virus increased to a titer of 1 after nine months, then below the level of detection to a titer of <2 at twelve months. The titer for the IDU-inactivated virus increased during the six to twelve month testing period see Figure 5. The HA bio-activity of the untreated and BEI-inactivated H1N2 viruses stored at 40-42°C retained a titer of 6 for the first three days of incubation. The HA bio-activity of the BEI inactivated H1N2 virus decreased below the level of detection after fourteen days, then had a low level of activity at one month. The HA bio-activity of the untreated and IDU inactivated H1N2 viruses decreased below the level of detection after 1 month, see Figure 6. The H1N2 virus inactivated with BEI maintained similar HA bio-activity as the untreated H1N2 virus at the 2-7°C, 22-25°C and 35-39°C storage temperatures. The HA bio-activity of the BEI inactivated H1N2 virus decreased more rapidly than the untreated virus at 40-42°C. The HA bio-activity of the H1N2 virus inactivated with IDU decreased at a greater rate at every storage temperature than the untreated or BEI inactivated viruses. The HA bio-activity of the untreated and BEI-inactivated H3N2 viruses stored at 2-7°C fluctuated between titers of 6 and 7 through twelve months of incubation. The HA bio-activity of the IDU-inactivated H3N2 viruses stored at 2-7°C fluctuated between titers of 6 and 7 through the first two months of incubation then between titers of 5 and 6 through twelve months, see Figure 7. The HA bio-activity of the untreated and BEI-inactivated H3N2 viruses stored at 22-25°C fluctuated between titers of 6 and 7 through twelve months of incubation. The HA bio-activity of the IDU-inactivated H3N2 viruses stored at 22-25°C fluctuated between titers of 6 and 7 through the first two months of incubation, then between titers 5 and 7 through twelve months, see Figure 8. The HA bio-activity of the untreated H3N2 virus stored at 35-39°C fluctuated between titers of 5 and 6 through the first four months of incubation, then decreased to a titer of 4 after twelve months. The HA bio-activity of the BEI-inactivated and the IDU-inactivated H3N2 viruses stored at 35-39°C fluctuated between titers of 5 and 7 for the first two months, then between titers of 3 and 6 through nine months of incubation. After twelve months of incubation the BEI-inactivated H3N2 virus retained a titer of 3, whereas the IDU-inactivated H3N2 virus 1HA bio-activity was not detected (titer <2), see Figure 9. The HA bio-activity of the BEI-inactivated H3N2 virus stored at 40-42°C was below the level of detection (titer of <2) after seven days and fluctuated between a below the level of detection and 2 through four months. The HA bio-activity of the untreated H3N2 virus fluctuated between a titer of 2 or 3 throughout one month, then was not detected two months. The HA bio-activity of the IDU-inactivated H3N2 virus started with a titer of 6 and retained a titer of 5 through the first month of incubation. After two months the IDU-inactivated H3N2 virus had a titer of 3, and then was undetectable after four months. Testing of all samples stored at 40-42°C was ceased after four months, see Figure 10. There was no real difference in the HA bio-activity for any of the H3N2 virus treatments through twelve months of storage at 2-7°C, 22-25°C and 35-39°C; the only exception being the loss of HA bio-activity to below the level of detection of the virus inactivated with IDU on the twelve month testing date. The HA bio-activity of the H3N2 virus inactivated with IDU appeared to be much more stable than the untreated or BEI inactivated H3N2 viruses through two months of storage at 40-42°C. Testing was performed to determine whether the hemagglutinin protein from Swine Influenza Virus (SIV) isolates H1N2 and H3N2 is stabilized by the compound IDU using expanded inactivation conditions. Data from Phase I.B. demonstrated that 0.5% IDU was effective in the complete inactivation of SIV infectivity of both isolates (H1N2 and H3N2) after a 72 hour incubation at room temperature and did not affect the HA protein's ability to hemagglutinate red blood cells. However, the incubation of inactivated viruses at elevated temperatures resulted in different levels of HA bio-activity stability over time. The level of HA bio-activity stability was not the same for all the isolates tested. Treatment of all Phase 3 samples with 0.5%, 1.0%, or 2.0% IDU for 24, 48, and 72 hours resulted in complete SIV infection inactivation (≤1.5 TCID50/ml). No cytopathic effect was observed in indicator cells. As expected, there was a minimal cytotoxic effect due to the IDU. The SIV positive control (not inactivated) yielded a titer of 5.5 TCID50/ml on the indicator cells. The H3N2 SIV isolate was inactivated using 0.5% IDU at room temperature, 35-39°C and 40-42°C for 24, 48 and 72 hours. The H1N2 SIV isolate was inactivated using 0.5%, 1.0% and 2.0% IDU at room temperature, 35-39°C and 40-42°C for 24, 48 and 72 hours. Bulk preparations of each sample were placed at 2-7°C, 35-39°C and 40-42°C for the forced degradation assay. Samples were collected and tested for HA bio-activity on days 0, seven, fourteen, and twenty-one, and once monthly for six months. The HA bio-activity was tested at time 0, day seven, day fourteen, day twenty-one, and once monthly for six months. All samples collected to date have been tested for HA bio-activity using cRBC. The positive control (H3N2 not-inactivated) had an HA bio-activity titer of 6 or 7 during the six months. The initial HA bio-activity was retained in all samples tested regardless of the incubation temperature or time of incubation used to inactivate the samples. The HA bio-activity of all H3N2 viruses stored at 2-7oC retained an HA titer of 6 during the first month of incubation, then fluctuated between titers of 5 and 6 through six months, see Figure 11. 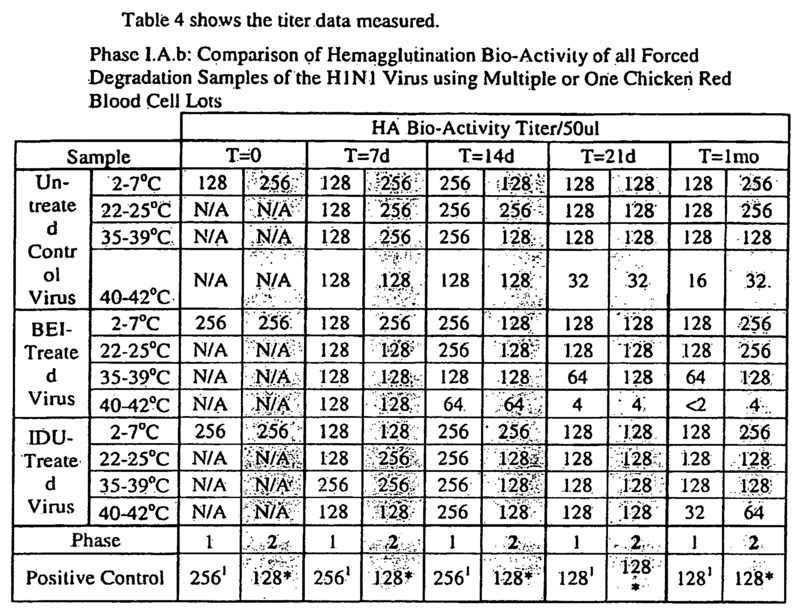 The HA bio-activity of all H3N2 viruses stored at 35-39°C retained an HA titer of 6 during the first month of incubation, then fluctuated between titers of 4 and 5 through six months see Figure 12. The HA bio-activity of all H3N2 viruses stored at 40-42°C retained a titer of 6 for the first seven days then decreased to a titer of 3 after two months. The HA bio-activity of all H3N2 viruses fluctuated between titers of 2 and 4 through five months of incubation, then was not detected (titer <2) after six months, see Figure 13. There was no real loss of HA bio-activity for any of the H3N2 virus treatments stored at 2-7°C through six months. All treatments of the H3N2 virus stored at 35-39°G retained a HA bio-activity titer of 6 through one month, then dropped to a titer of 4 after six months. All treatments of the H3N2 virus stored at 40-42°C retained HA bio-activity titers within 2-fold of each other throughout six months except at the four month testing date. After four months of storage at 40-42°C, there was a 3-fold difference in titer between the virus inactivated at 37°C for 24 and 48 hours and the virus inactivated at 41°C for 72 hours. However, all treatments stored at 40-42°C returned to a titer of 3 after five months, then the HA bio-activity was not detected after six months. The HA bio-activity has been tested at time 0. days seven, fourteen twenty-one, and each month for six months. All samples collected to date have been tested for HA bio-activity using cRBC. The HA titer for the positive control (H1N2 not-inactivated) remained consistent at 7 or 8 during the six months. The incubation temperature, time of incubation, or concentration of IDU used to inactivate the samples did not affect the initial HA titer. The HA bio-activity of all H1N2 viruses inactivated with 0.5% IDU and stored at 2-7 °C fluctuated between titers of 6-8 through six months of incubation, see Figure 14. The HA bio-activity of all H1N2 viruses inactivated with 0.5% IDU and stored at 35-399°C fluctuated between titers of 7 and 8 through the first seven days, then fluctuated between titers of 5 and 7 through four months of incubation. The HA bio-activity of the H1N2 viruses fluctuated between titers of 4 and 5 after five months of incubation and then decreased to a titer of 4 after six months, see Figure 15. The HA bio-activity of all H1N2 viruses inactivated with 0.5% IDU and stored at 40-42°C fluctuated between a titer of 7 and 8 for the first seven days, then fluctuated between a titer of 5 and 6 through three months of incubation. After six months of incubation the HA bio-activity of all H1N2 viruses decreased to a titer of 2 or 3 see Figure. 16. The HA bio-activity of all H1N2 viruses inactivated with 1.0% IDU and stored at 2-7°C started at a titer of 7 or 8 and fluctuated between titers of 6 and 7 through five months of incubation. After six months of incubation the HA bio-activity of all H1N2 viruses decreased to a titer of 6, see Figure 17. The HA bio-activity of all H1N2 viruses inactivated with 1.0% IDU and stored at 35-39°C started at titers of 7 or 8, then fluctuated between a titer of 5 and 7 through three months of incubation. After six months of incubation the HA bio-activity of all H1N2 viruses decreased to a titer of 4, see Figure 18. The HA bio-activity of all H1N2 viruses inactivated with 1.0% IDU and stored at 40-42°C started at titers of 7 or 8, then fluctuated between titers of 4 and 6 through three months of incubation. After six months of incubation the HA bio-activity of all H1N2 viruses inactivated at room temperature for 24 or 48 hours decreased to a titer of 1 and all remaining H1N2 viruses decreased to a titer of 2, see Figure 19. The HA bio-activity of all H1N2 viruses inactivated with 2.0% IDU and stored at 2-7°C fluctuated between titers of 5-7 through six months of incubation, see Figure 20. The HA bio-activity of all H1N2 viruses inactivated with 2.0% IDU and stored at 35-39°C started at a titer of 6 or 7, then fluctuated between titers of 4 or 6 through four months of incubation. After six months of incubation the HA bio-activity of all H1N2 viruses decreased to a titer of 3, see Figure 21. The HA bio-activity of all H1N2 viruses inactivated with 2.0% IDU and stored at 40-42°C decreased from a titer of 6 or 7 to titers of 3 and 4 after two months of incubation. The HA bio-activity of all H1N2 viruses returned to a titer of 5 after three months. After six months of incubation, the H1N2 viruses inactivated at room temperature (24, 48 or 72 hours) or at 37°C for 24 hours decreased below the level of detection (titer of <2); the H1N2 viruses inactivated at 37°C for 48 or 72 hours decreased to a titer of 1; and the H1N2 viruses inactivated at 41°C (24, 48 or 72 hours) decreased to a titer of 2, see Figure 22. The H1N2 virus was inactivated using 0.5%, 1.0% and 2.0% IDU at various temperatures and incubation periods. Each inactivated preparation was placed at 2-7°C, 35-39°C and 40-42°C for storage for six months. The initial HA bio-activity of all H1N2 viruses inactivated with 0.5% and 1.0% IDU was slightly higher than the initial HA bio-activity for the H1N2 viruses inactivated with 2.0% IDU, average of 7.3 and 6.7, respectively. There did not appear to be an overt difference between the inactivation conditions regarding the stability of the HA bio-activity during incubations at the lower temperatures. However, there was a slight increased in the retention of HA bio-activity in the groups when incubations were performed at higher temperature. There was no real loss of HA bio-activity for any of the H1N2 viruses stored at 2-7°C; the titer for all viruses after six months was within 2-fold of the original titer. The pattern of HA bio-activity for all H1N2 viruses stored at 35-39°C was similar; all viruses decreased 3 to 4-fold in titer after six months of storage. The pattern of HA bio-activity for all H1N2 viruses stored at 40-42°C was also similar, but the stability of the HA bio-activity appeared to decrease slightly as the concentration of IDU used for inactivation increased. All H1N1 isolate samples collected within the first fifteen months of storage were also tested using one lot of cRBCs. This testing was conducted to determine whether differences in HA titers were observed between each of the original testing dates (in which various lots of cRBCs were used) and using one lot of cells. Small differences were observed between the titers (within 2-fold) and are probably attributable to the natural variation of the assay. Samples of the untreated H1N1 virus collected at 3 and 3.5 months of storage at 40-42°C had no detectable titer when originally tested (titer <2), but had titers of 8 and 16, respectively, when tested using one lot of cRBCs (Appendix II). It is possible that there was some degradation of virions in these samples that may have caused the number of HA subunits per particle to increase if all HA subunits disassociated from the virion. The H1N2 and H3N2 isolates were assayed through one year of storage at 2-7°C, 22-25°C, 35-39°C and 40-42°C and the stability of the IDU-treated samples compared to BEI-treated or untreated samples. The isolates were inactivated using IDU or BEI at room temperature for 72 hours. IDU did not appear to provide much stability of HA bio-activity of the H1N2 preparation used in this phase of the study. The IDU-treated H1N2 isolates had a lower amount of HA bio-activity at every storage temperature throughout the 12 month period (Figures 3-6). This was not true for the H3N2 isolate. Although there was no real difference in HA bio-activity between any of the H3N2 isolate treatments at the 2-7°C, 22-25°C or 35-59°C. storage temperatures, the IDU-treated isolate maintained a 3 to 5-fold higher HA bio-activity titer than the BEI-treated isolate at the 40-42°C storage temperature (Figures 7-10). Therefore, it appears that the H3N2 isolate benefitted from treatment with IDU if stored at 40-42°C. The H1N2 and H3N2 isolates were also assayed through six months of storage at 2-7°C, 35-39°C and 40-42°C; however these samples were not compared to BEI or untreated isolates. Instead, various conditions of IDU-inactivation were compared. No real difference was observed between the HA bio-activity of the isolates inactivated using the various conditions; all conditions tested were within 2-fold of each other at each testing period (Figures 11-22). The H3N2 isolate behaved very similarly between this phase of the study (Figures 11-13) and the phase in which the isolate was inactivated only at room temperature for 72 hours (Figures 7-10). The HA bio-activity of the H1N2 isolates inactivated using 0.5% IDU appeared to be slightly more stable than the isolates inactivated with 1.0% or 2.0% IDU at the elevated temperatures (35-39°C and 40-42°C). This supports previous studies that suggested a range of 0.25% to 0.5% IDU was useful to inactivate virus and stabilize HA bio-activity. The H1N2 preparation used in this phase of the study (Figures 14-22) appeared to be much more stable than the preparation used in the earlier studies where the isolate was inactivated at room temperature for 72 hours (Figures 3-6); this was most evident especially at the higher temperatures. This may be because the H1N2 isolate used in this phase of the study was re-expanded and the new material had a 2-fold higher HA bio-activity titer than the previous material. The increased number of virions and the resulting change in the ratio of IDU to virus mass may have aided in its overall greater stability in this phase of the study. These results suggest that IDU is beneficial for stabilizing the HA bio-activity of the H1N1 and H3N2 isolates, compared to BEI-treatment, when stored at elevated temperatures. The H1N2 isolate also appeared to have benefitted from treatment with IDU, but not this was not consistent between two preparations of the virus. There is a greater amount of HA stability observed with the H1N2 isolate if the initial HA bio-activity is higher (at least 7), but the stabilization of this isolate at the higher initial titer was not compared to BEI-treatment. These results also support previous data suggesting that a concentration of 0.5% IDU is optimal for use in inactivating virus and stabilizing HA bio-activity. Parts by weight as used herein refers to 100 parts by weight of the composition specifically referred to. Any numerical values recited in the above application include all values from the lower value to the upper value in increments of one unit provided that there is a separation of at least 2 units between any lower value and any higher value. As an example, if it is stated that the amount of a component or a value of a process variable such as, for example, temperature, pressure, time and the like is, for example, from 1 to 90, preferably from 20 to 80, more preferably from 30 to 70, it is intended that values such as 15 to 85, 22 to 68, 43 to 51, 30 to 32 etc. are expressly enumerated in this specification. For values which are less than one, one unit is considered to be 0.0001, 0.001, 0.01 or 0.1 as appropriate. These are only examples of what is specifically intended and all possible combinations of numerical values between the lowest value and the highest value enumerated are to be considered to be expressly stated in this application in a similar manner. Unless otherwise stated, all ranges include both endpoints and all numbers between the endpoints. The use of "about" or "approximately" in connection with a range applies to both ends of the range. Thus, "about 20 to 30" is intended to cover "about 20 to about 30", inclusive of at least the specified endpoints. The term "consisting essentially of" to describe a combination shall include the elements, ingredients, components or steps identified, and such other elements ingredients, components or steps that do not materially affect the basic and novel characteristics of the combination. The use of the terms "comprising" or "including" to describe combinations 'of elements, ingredients, components or steps herein also contemplates embodiments that consist essentially of the elements, ingredients,components or steps. Plural elements, ingredients, components or steps can be provided by a single integrated element; ingredient, component or step. Alternatively, a single integrated element, ingredient, component or step might be divided into separate plural elements, ingredients, components or steps. The disclosure of "a" or "one" to describe an element, ingredient, component or step is not intended to foreclose additional elements, ingredients, components or steps. wherein the method is free of any step of contacting the virus with binary ethylene-imine, formaldehyde, formalin, phenol, 2-phenoxyethanol, thimerosal, bromo-ethylene-imine, ethyl methane sulfonate, nitrosoguanidine, fluorouracil, 5-azacytadine, or any combination thereof. A method of claim 1 wherein the virus of the providing step (a) is grown in a tissue or in vitro cell culture before the contacting step (b). A method of claim 1 or 2 wherein the non-crosslinking chemical fixative is imidazolidinyl urea (IDU). A method of any one of claims 1 to 3 wherein the contacting step (b) occurs for a period of 24 to 72 hours. A method of any one of claims 1 to 4 wherein the contacting step (b) occurs at a temperature of about 23 °C to about 37 °C. A method of any one of claims 1 to 5 wherein the method includes a step of freeze-drying and re-hydrating the antigen-treated virus. A method of preparing a vaccine composition comprising the method of any one of claims 1 to 6 which further comprises: c) mixing a non-toxic effective amount of the deactivated virus with a pharmaceutically acceptable carrier for forming a vaccine composition for inducing an immune response in a subject to which the vaccine is administered. A method of claim 7 wherein the virus is provided in a live titer amount of 106 to 1012E1D50 per milliliter of the resulting vaccine composition. A method of claim 7 or 8 wherein the mixing step (c) occurs immediately following the contacting step (b). A method according to any one of claims 1 to 6 wherein the contacted composition with the deactivated virus is transported or stored at ambient temperature. A method of claim 1 wherein the virus of the providing step (a) is manufactured by growing the virus in a chicken egg before the contacting step (b). A composition of claim 12 wherein the composition can be transported and stored at ambient temperatures. ES2251307B2 (en) 2004-10-05 2006-12-16 Universidad Complutense De Madrid Solution for the indefinite maintenance of nucleic acids in their cell of origin. ES2350109T3 (en) 2011-01-18 Procedure for the inactivation of lipid-enveloped viruses.